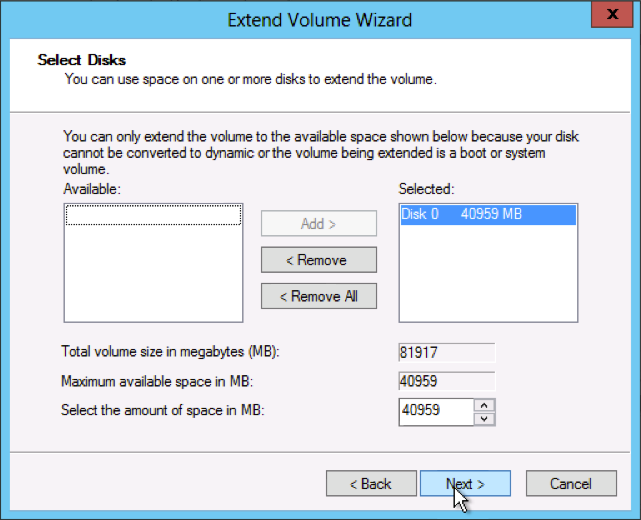 This tutorial will show you how to increase disk space after upgrading Windows Server package. Despite all other resources like RAM, CPU and so on are increased automatically you will need to perform some additional steps in order to utilize the new disk space that is available for your server. In Windows Server you can merge the newly available disk space into one drive by expanding your original drive. Connect to your Windows Server via RDP. You can find tutorial on how to do it here. From the desktop of your Windows Server, open the Server Manager and select Tools > Computer Management. Under the Storage folder in the left pane, select Disk Management. The left pane of Disk Management displays the current formatted hard drive for your server, generally (C:), and the right pane displays the amount of unallocated space. To add all available space to your C:\\ drive (Disk 0) you can keep the default selections and press Next. You will now see the C:\\ drive expand to the maximum available space. To finalize the modifications click Finish. The additional disk drive volume is now displayed in Computer Management and is available to use. You can verify that the Extend process worked correctly by loading the Computer Manager from the Server Manager and checking the disk size for the C:\\ drive in Disk Management.